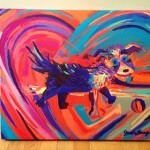 All my paintings have a deeper spiritual meaning and metaphor. and this painting is no exception. 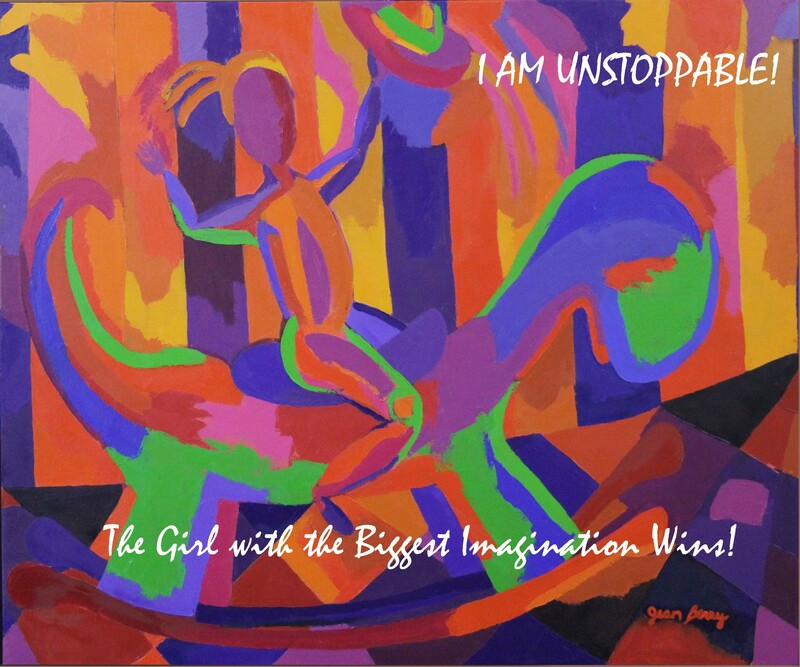 This painting is about the miracles that occur when you stay tenaciously in action on a project. The law of attraction insists that what you stay focused on and in action on will come to pass. Of course, the way the outcome comes to pass is still up to the Divine. Just as this sweet, intense dog may not get a walk, he’s sure to at least get a belly rub. The Daily practice that is a natural match for this painting is Gratitude. When you hold time each day focused on gratefulness to the outcomes you wish for and experience makes the law of attraction move even faster. Tenaciously hold yourself grateful, watching for an opportunity to receive the miracles that show up daily. 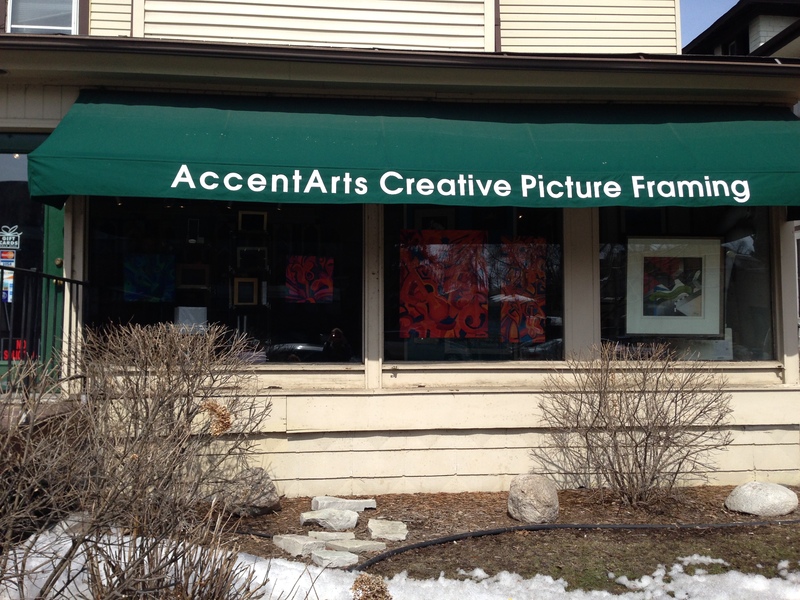 My paintings are hanging in the window at Accent Arts Creative Framing at 1618 Lake Street in Minneapolis. I am thrilled to be an Artist in Residence and in partnership at this amazing Framing store. 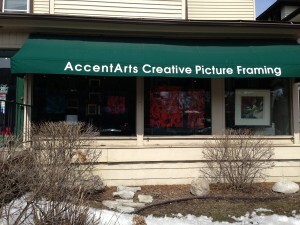 Accent Arts has been in business there for years and at the end of June the building will be torn down to make way for more condos…..did we need more condos in uptown? I’ll keep you updated on the new location as soon as it’s determined. 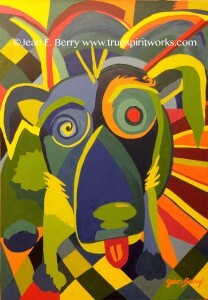 In the meantime, make your way uptown and make sure to stop in and see Greg at Accent Art. Better yet, what framing do you need done? Greg does a fantastic job at framing–paintings, photographs and shadow boxes. You will love the skill, precision and artistic eye that he brings to framing. See This Cute Doggy at the Crawl! Have you ever had a dog that almost wagged their tail off because they were so excited to see you? 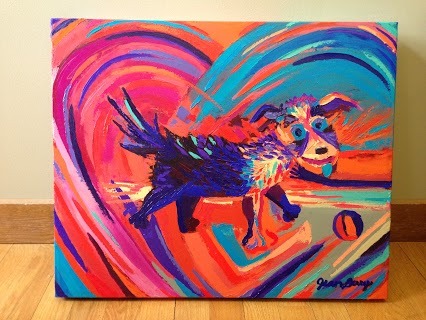 This painting shows the kinetic energy that happens all around when you’re with a dog that loves you that much. How’s that for unconditional love? We could all learn from this puppy! Hope to see you at the crawl on Saturday! It makes me smile! I was working on this painting and butterflies kept showing up. I kept trying to turn them into something else, because I’m not really a butterflies, rainbows and unicorns kind of girl (although they do make me smile). I was listening to the radio and I heard the Alt band Cake singing “Long Time” and at one point I thought they sang, “it’s been a long time since we were butter-fly-y-y-y-y-y-y-y-s” (of course, that’s not the lyric…it’s “since you gave me butter-fly-y-y-y-y-y-y-ys”). But my mind started to swirl around that idea….what would that mean if we had been butterflies and aren’t now? I thought of butterflies that are beautiful and flit around….it made me think of youth. I’m not as young and beautiful as I once was, but I don’t actually mind. I love what maturing and wisdom have brought me. I also love the new beautiful I am and the beauty I can create for the world. So, It’s Been a Long Time Since We Were Butterflies….But I don’t Mind. What do the butterflies mean for you? My lovely late friend, Lynn True, thought that butterflies were divine messengers. When they crossed your path, it meant everything was going well for those who have passed to the other side. So from Lynn on the other side, I will take these butterflies as a divine message….thanks for letting me know! We are meaning making machines….that’s completely what my paintings are about. What do they mean for you, how do you create an empowering story around your life and how do you hold it in place? I think art is an amazing way to do that. It’s lasting, it holds an image that can take you back to that empowering place. You can build a story around it that lasts your lifetime, and then you can pass it down to generations. How can I help you build an empowering story for your life and for your legacy? 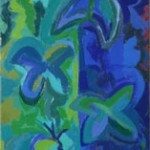 Each of my paintings are designed as ambassadors and support for your life. As I paint, I infuse them with the energy that will actually raise the vibrational level of your space and support you in living your highest and best life. That’s what I do….what will you do?